One of my goals for the new year is to keep better track of my reading. To that end, I'm going to try to write brief reviews of books I've finished each month. 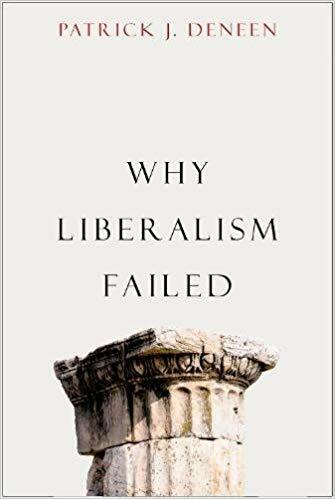 Why Liberalism Failed, Patrick J. Deneen. We need to be clear up front that this book's title should not be read in modern terms. This is not some argument for modern "conservatism" against modern "progressivism." No, Deneen's ambitions are much grander. In this tour de force, he takes aim at liberalism in the sense of "enlightenment liberalism" or "liberal democracy" - the whole set of ideas that underpin our nation and much of the modern world. Given the massive scope of the critique, it is hard to assess whether it succeeds or fails as a whole. I suppose the future will have to be the judge of that. However, what Deneen does very well is to point out many of the dark undersides of systems we hold dear. For instance, against the modern left he would point out ways that inequality is actually baked into our system of meritocracy and self-determination; against the modern right, he would insist that markets, just as much as or more than the state, are responsible for the destruction of traditional institutions like family and church. Over and over, the book makes the case that the problems our two parties quarrel over are a result of what they hold in common, not what they disagree about. Add to that a very sane final chapter about "solutions" that avoids both naive idealism and chasing some other, equally-problematic system and you have the makings of a very good book. Personally, Why Liberalism Failed did a good job of expressing many of the ways I think Christians should regard modern America, regardless of political or cultural affiliation, as hostile territory. The kingdom of heaven must sit uncomfortably beside all worldly kingdoms, and Deneen identifies many of the ways that discomfort is true of our time and place. Not a book for those completely new to the topic of cultural critique, but an important one to those who follow such conversations. 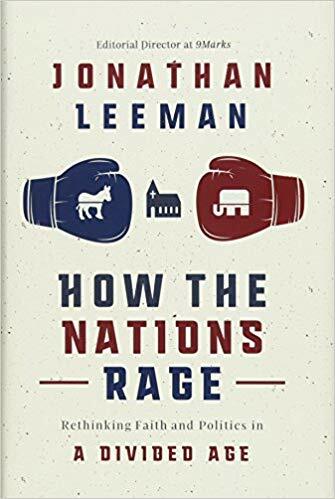 How the Nations Rage: Rethinking Faith and Politics in a Divided Age, Jonathan Leeman. I'll try to keep this one briefer than the above. Leeman writes an excellent introduction to biblical politics for evangelical Christians. My highest praise for this book rests in the way it balances two tasks: it keeps the ideas simple enough to be accessible while keeping the issues as necessarily complicated as they are. Both politically conservative and politically liberal Christians will find much here to challenge them and much else on which they can find common ground. This is my new go to for thoughtful congregants who want a solidly Biblical book on politics (replacing Onward by Russell Moore, although it is still a good book). 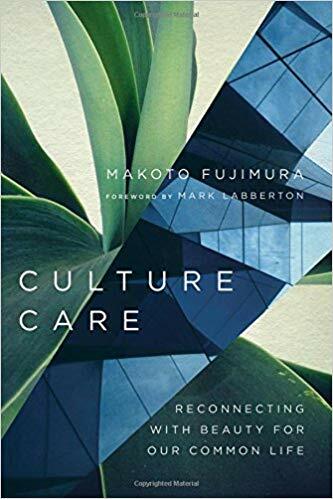 Culture Care: Reconnecting with Beauty for Our Common Life, Makoto Fujimura. One of my common complaints about theologically-inclined Christian literature is that it tends to appeal to left-brained, analytical types while leaving thoughtful Christian artists and creative types behind. In many ways, this book is intended as an answer to this failing. Makoto Fujimura, himself an accomplished painter and advocate for the arts, unpacks a theological framework within which we can understand creativity and the creation of beauty as essential and redemptive parts of our Christian calling. As an intellectual work, the book is imperfect. There are elements of the argument that I think fail to land and a few frustrating leaps from one idea to the next. However, that is more than offset by an exploration of questions about art, culture and the church which are largely unexplored. If you are a believer seeking to use your artistic gifts in the service of Christ and His kingdom, I can think of no better manifesto to start you intentionally thinking about that path. 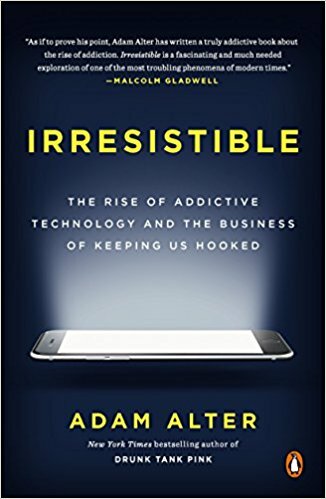 Irresistible: The Rise of Addictive Technology and the Business of Keeping Us Hooked, Adam Alter. As a pastor, I am consistently struck by how deep our problems with technology run and how little time we spend reflecting on it. Our families, our time, and even the very structure of our minds are being warped by our devices in ways many people haven't even begun to confront. Alter provides a comprehensive look at many of these challenges through the lens of modern psychology and theories about behavioral addiction. If you find yourself wrestling to find a good balance in your relationship with technology (like I do), and especially if you are trying to discern questions of screens in parenting, I would recommend taking the time to work through Alter's work. Many of us are dabbling with a drug whose effects we are only beginning to understand, and we should be as informed as possible. 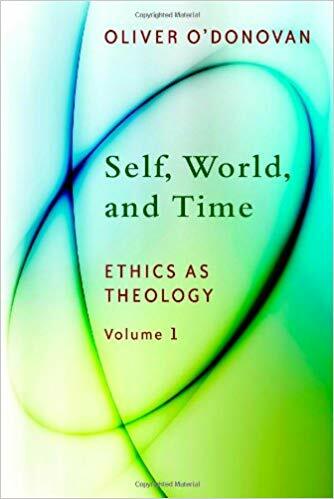 Self, World, and Time: Ethics as Theology, Volume 1, by Oliver O'Donovan. One of the practices I try to maintain is always having at least one book going I consider challenging - something academic and technical that stretches me as a reader. My current project on this front is working through O'Donovan's trilogy of books on moral theology. They are "dense" in a way few books manage - thought is developed not at the level of paragraphs but of sentences, and a half page spent distracted often left me lost and having to backtrack. That said, this is really a phenomenal work. What I appreciate the most about O'Donovan's ethical framework is the way he maintains the necessary complexity of the issues. Moral choices must be situationally nuanced while still conforming to objective standards; ethics cannot be understood without attention to who we are and what our place is in the world. In addition, O'Donovan does a wonderful job of being practical without embracing the utilitarian pragmatism of many modern approaches. This book is not for the faint of heart, or really for anyone without some amount background in philosophy and theology. However, if you're looking for a stretching read, I would highly recommend it.